Founders often make awkward teammates for public market investors. Mike Ashley of Sports Direct is a case in point. Winning boards strictly referee the differences between ownership and management. Ashley’s proposed bonus, revealed on July 2, suggests Sports Direct has failed to get the balance right. Ashley, who owns 58 percent of Sports Direct, has managed to more than double the sports company’s share price since it floated seven years ago. But despite serving as “executive deputy chairman” he has neither drawn a salary, been awarded a bonus, nor received a dividend. Independent shareholders pushed back on two attempts by the company to award him a personal bonus. On July 2, with Ashley recusing himself from the vote, a share-based bonus plan was approved with a 60 percent majority. There’s one good part of the new plan: stretching performance conditions. Vesting is due in 2019 and 2021 and depends on a near-doubling of EBITDA. But there’s far more that’s bad. Crow-barring Ashley’s bonus into a general employee scheme looks a bit sneaky, given the previous rejections. Worse, the company won’t say how much of the bonus scheme Ashley will get. Given that the plan is currently worth 180 million pounds and will rise if targets are hit, that’s some omission. The basic problem is the conflation of Ashley’s position as shareholder with his role as an executive. Ideally, the two are complementary. And yes, there is a place for executives to have share-based pay incentives. The danger is that the Sports Direct scheme becomes a mechanism to give one shareholder – Mike Ashley – a dividend-like payout that other owners will not get. It ought to be possible for a company to employ its main shareholder. But it is imperative to keep distance between the differing sets of loyalties and responsibilities. An employee, after all, has to work in the interests of all shareholders. The better pay policy here would be a conventional salary-and-bonus package to Ashley for his three or four days a week job. Then if the company does well, it can reward him like any other shareholder: with dividends. 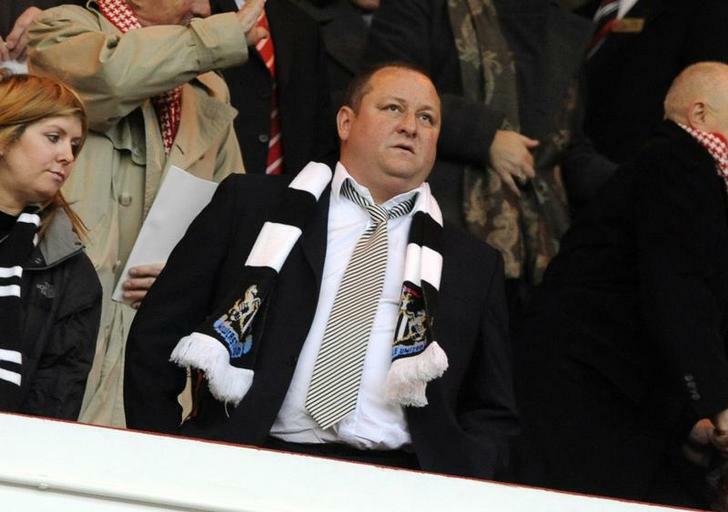 Newcastle United's owner Mike Ashley watches ahead of their English Premier League soccer match against Sunderland in Sunderland, northern England January 16, 2011. Investors in Sports Direct, the UK retailer, approved a plan on July 2 to create a special share-based bonus scheme with a value, based on current market prices, of 180 million pounds. The scheme will see the creation of 25 million new shares, equivalent to 4.2 percent of the existing equity capital. The shares will vest if the company generates EBITDA of 750 million pounds in the year to April 2019. Thomson Reuters Eikon estimates are that the company will make EBITDA of 393 million pounds in the current year. According to the UK’s Guardian newspaper, the company’s founder refused to comment and left in a helicopter after a five-minute meeting attended by just three shareholders.